Heart procedures in presidents: Problems with George W. Bush, Barack Obama, and Bill Clinton cardiac care. Even U.S. presidents don’t always get the best cardiac health care. Where does that leave the rest of us? 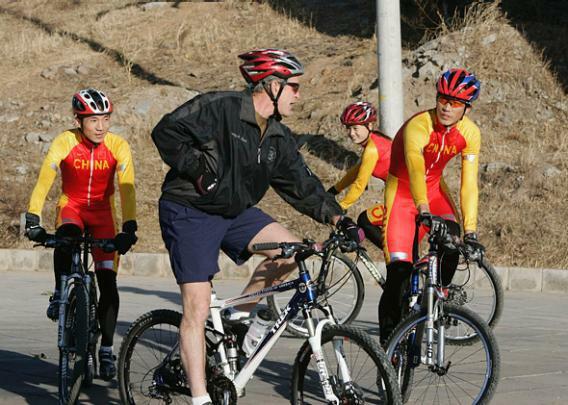 President George W. Bush joins Chinese cyclists for an afternoon ride at the Laoshan Olympic Mountain Bike course in western Beijing in 2005. Now 67 years old and in exceptionally good health—he reportedly cycles dozens of miles at a time—former President George W. Bush earlier this month had a checkup. He took several medical tests, including a treadmill exercise stress test that showed a problem. He immediately had a chest CT scan that confirmed a coronary blockage, and the following day, doctors implanted a stent to prop open the president’s narrowed artery. Many prominent doctors immediately criticized the president’s medical care. Cleveland Clinic’s chief of cardiology, Steve Nissen, suggested the procedure was pointless, as did cardiologist and Medscape editor Eric Topol. ABC’s chief medical editor and former Centers for Disease Control and Prevention director Richard Besser tweeted the cardiac stent was “not indicated.” Many of my cardiology colleagues privately echoed the same concerns. The reason for their criticism, as I wrote in Slate several years ago, is that cardiac stents don’t prevent heart attacks, prolong life, improve symptoms, or do much of anything in people like the former president who have no symptoms, such as chest pain with exercise. Yet the costs of the procedure range from $30,000 to $50,000. Questionable cardiac care is a common problem for presidents. In 2010, doctors for then-48-year-old Barack Obama ordered a heart CT scan to look for mild blockages, even though their patient also had no symptoms. Ironically, this occurred at the height of the debate over the Affordable Care Act, which is intended to improve health care affordability. Obama’s pointless test was in direct violation of the president’s own U.S. Preventive Health Services Task Force guidelines and American Heart Association’s recommendations, as Rita Redberg, the editor of the Archives of Internal Medicine, quickly pointed out. Had a blockage been found, it’s entirely possible that Obama too might have ended up with an implanted stent for no clear reason. A different heart care problem affected Bill Clinton in 2004, when he had symptoms of an impending heart attack. He was transferred from a hospital near his home in Chappaqua, N.Y., to Columbia-Presbyterian Hospital in New York City for urgent cardiac bypass surgery. Though other states have followed suit, New York at the time was an unusual state for heart surgery. Since 1991, state authorities had collected hospital- and surgeon-specific results for heart surgeries, using statistical techniques to adjust for case complexity. Anyone could look up the stats online. At the time of Clinton’s surgery, the hospital he chose had the highest death rates from cardiac surgery of any of the 35 hospitals doing such procedures, and his specific surgeon had the highest death rates among the four staff surgeons who did more than 100 cases per year. (Remember these were “risk-adjusted” rates and can’t be dismissed by claiming these surgeons’ patients were sicker.) The former president went on to have a complication requiring another surgery. If even our most prominent and well-connected citizens can’t get the best evidence-guided care, where does that leave the rest of us? Though doctors are some of the most hypereducated professionals around, they frequently don’t deliver care that has stood up to the most rigorous research. In a landmark 2003 study, for example, RAND researchers found that only about half of Americans were getting recommended care for conditions ranging from alcohol addiction to diabetes to back pain. This is especially galling in cardiology, where clear, evidence-based guidelines spell out the right treatments for everything from hearts attacks to valve diseases. But these up-to-date standards are often ignored even though hospitals that follow them have better results. Today, almost 10 percent of all stents are placed for the wrong reasons, as many believe Bush’s was. In trying to unpack how good practices take hold in medicine, writer and physician Atul Gawande identifies painstaking, door-to-door salesmanship as the key in convincing health providers to do the right thing, like wash their hands or use checklists. Over the past few years, the American Heart Association did just that and created a program called “Get With the Guidelines” that measured and rewarded doctors who followed the evidence. But the measures were almost always of things that doctors should be doing, like giving the right medicines after a heart attack. That’s certainly important. But I’d also love to see whether cardiologists follow guidelines about what they shouldn’t be doing, like ordering heart CT scans or erroneously putting in stents. Following high-profile cases of “overstenting” in Maryland (one cardiologist implanted almost 600 stents unnecessarily), the state last year created a mandatory peer-review process for cardiac stents—essentially requiring a second, unbiased opinion to ensure your doctor is doing the right thing. (The law’s impact hasn’t yet been studied.) Some cardiology centers wisely perform such reviews internally already and report their results to regional databases to compare their care with other centers. Another option is to enhance the “informed consent” process before heart procedures. Currently, patients fill out a multipage paper form about procedure risks as a formality, but they rarely pay attention to the many details. In one pilot program, doctors created a personalized, computer-based consent procedure to better inform patients about their options, based on their specific clinical profiles. Fewer patients chose expensive drug-eluting stents. For years, policymakers have decried wasteful health care spending. But when even our leaders don’t get the kind of care that science demands, it becomes clear that the system needs key safeguards to help all Americans avoid unnecessary, potentially dangerous interventions.